There is continual pressure from law enforcement authorities to be given increased powers. Such powers would typically involve increasing restriction of citizens’ rights. This may involve: longer periods of arrest without charge; an increased number of offences; a broader definition of offences. There is also an increase in the number of offences for which the onus of proof has effectively shifted from the state (the prosecution) to the defendant (the person charged). As I pointed out in an earlier post, no practising doctor has the time to keep up with the amount of material published in medical journals. It is thus very difficult for doctors to keep up with the latest research. Couple with this the suggestion made by many that much of the research is skewed to obtaining the results which the pharmaceutical industry wants, and that pharmaceutical drugs are tested for statistical results, and it is little wonder that individually tailored treatment is difficult. This is a rare book and the author is a rare physician. Ranjana Srivastava is an oncologist working in Melbourne. She questions what she does and how she does it and strives to relate to her patients and their families with honesty and compassion. 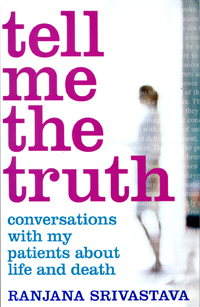 The title of the book reflects what many patients ask of her. There is a misuse of placebos in trials of pharmaceutical drugs. The placebo is supposed to be something that has no pharmacological effect, but in many trials this is not the case. There was a trial to examine the efficacy of a ‘natural’ remedy (an antioxidant). The trial concluded that it was no better than the placebo. What wasn’t made clear was that the ‘placebo’ used was vitamin C, known to have a beneficial effect in all manner of conditions, partly through its anti-oxidant properties. In researching one ‘natural’ remedy, the researchers assumed that another ‘natural’ remedy would have no effect and could therefore be used as a placebo. In another trial, looking at the effect of sugar on the behaviour of children, the ‘placebo’ used was chocolate biscuits! We live in complex societies. We elect various levels of government and we pay taxes for the services those governments provide. We buy services from any number of providers. 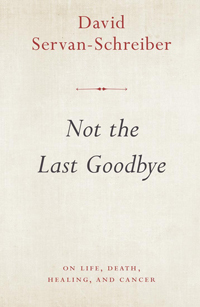 As it turns out, this book is the last goodbye from author David Servan-Schreiber. He wrote it during his tussle with brain cancer which had returned after many years. Servan-Schreiber was author of the book Anticancer: a new way of life (Viking, 2009) and was spokesperson for the Anticancer program; this played an important role in his approach to dealing with his illness.